U.S. air force A-10C attack aircraft HOTAS (hands on throttle and stick) replica joystick pack. Thrustmaster HOTAS Warthog Dual - Throttle - 16 buttons - wired - for PCU.S. 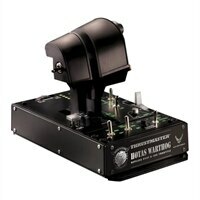 air force A-10C attack aircraft HOTAS (hands on throttle and stick) replica joystick pack.